Health inspections at restaurants so far in March in Sebastian, Florida. SEBASTIAN – Several restaurants had the health inspector in their kitchens this month in Micco and Sebastian. All restaurants passed their inspections and were not closed or shut down. Pelican Diner was the only establishment that passed with 0 violations so far in March. This was on 3/14/2019 at their Sebastian Municipal Golf Course location. 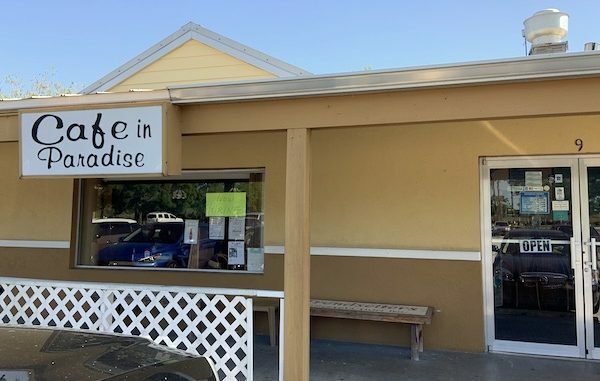 Cafe In Paradise, which is listed for sale, had 9 violations this month. During the inspection, an employee was seen touching ready-to-eat food with their bare hands, which is a High Priority violation. The food was discarded. The health inspector also found raw sausage stored over ready-to-eat foods. All violations corrected on-site. Wasabi Thai Sushi had 11 violations, but they were mostly “basic” things such as using cardboard and tin foil on shelving inside the kitchen. The only area of concern was “moderate encrusted material” found on the blade of a can opener. Other violations were for a light not working, worn gaskets in the freezer, no soap provided at a handwashing sink, and minor grease buildup on the hoods above the stove. Aunt Louise’s Pizzeria had 10 violations. The inspector found an accumulation of debris outside the dishwasher, microwave, pizza oven, and a shelf soiled in rust across a preparation table. “Ceiling/ceiling tiles/vents soiled with accumulated food debris, grease, dust, or mold-like substance,” the inspector wrote in the notes. All violations were corrected on-site, according to the report. RJ’s 2002 Restaurant in Micco, which is located in Barefoot Bay, had 9 violations total. There were 5 “High Priority” violations. An employee was seen touching food or utensils without washing hands after cracking raw shell eggs. “Employee cracked raw shell eggs and then handled ready-to-eat food and/or clean equipment or utensils without washing hands,” the inspector wrote. Another employee was seen touching ready-to-eat “food when plating after cooked.” They also had a problem with small flying insects in the food preparation area and food storage area. “3 flies in the kitchen, one landed on cutting board which was sanitized, killed one, continuously landing on electrical cords and bread bags,” according to the report. RJ’s also had cooked meats and meat sauce stored in the walk-in cooler longer than 24 hours without proper dates marked on the items. The cookline cooler was also soiled with accumulation of food residue. All violations were corrected on site. The health inspector returned the next day for a follow-up, and they passed with zero violations. The China Wok in Micco had 4 violations. The inspector found stored food not covered in the walk-in cooler, and raw eggs stored over ready-to-eat sauce. The ceiling also had some debris buildup near the food preparation area, which was a repeat violation. All violations corrected on-site during the inspection. We have updated our list of health inspections and how the Sebastian restaurants rank according to violations.